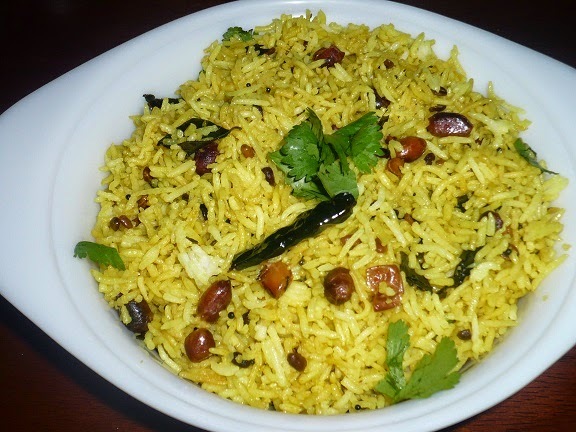 Lemon rice is very popular South Indian Variety rice and is simple and easy to make. Lemon rice goes well with roasted potatoes. It is a great travel food and can be used for packed lunch. Today we will learn how to make lemon rice/elumichai sadam following this easy recipe. Cook rice in such a way that each grains are separate. Spread it on a plate, mix a tsp of sesame seed oil to it, so that the grains will not stick together. Saute cashew nuts in 1/2 tsp oil until golden brown and keep it aside. Heat oil, add mustard seeds, when mustard splutters , add urad dal, channa dal, red chillies and asafoetida. When dal turns slightly brown, add green chillies, ginger, turmeric powder, curry leaves and finely chopped carrots (optional ). Saute until the carrots are slightly cooked. Squeeze lemon juice in a cup, add salt to it. Mix well and add it to the rice. Add the seasoning and cashew nuts also to the rice and mix well. Taste and see. If required add more salt and lemon juice. Serve with Papads or chips or roasted potatoes.